Can you smell the beguiling fragrance of Frangipani flowers? Can you feel the allure of Polynesian drumbeats echoing across the water? 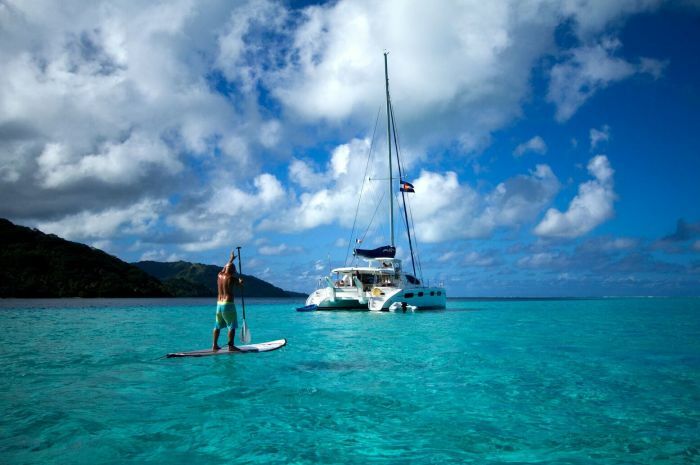 Can you envision yourself on a 48’ catamaran as it glides through the crystal-clear waters of an island atoll? Dies ist Ihre schönste Chance zu Cruise in polynesische Paradies,,en,Beitreten,,en,Wir empfehlen, Kontakt hoch Soun Saysomvang, die Bücher für Moorings Kunden Reisen,,en,Tahiti Flottille Cruise Hemd und Hut,,en,und auf Bora Bora,,en,und es gibt WiFi Zonen auf jeder Insel,,en! The beauty and unique character of the exotic islands of the Tahitian Leewards are a sailor’s dream adventure. Balmy easterly trade winds average between 15 und 20 Knoten. Temperatures range in the high 80’s and low 90’s this time of year, with water temperatures around 80°F. 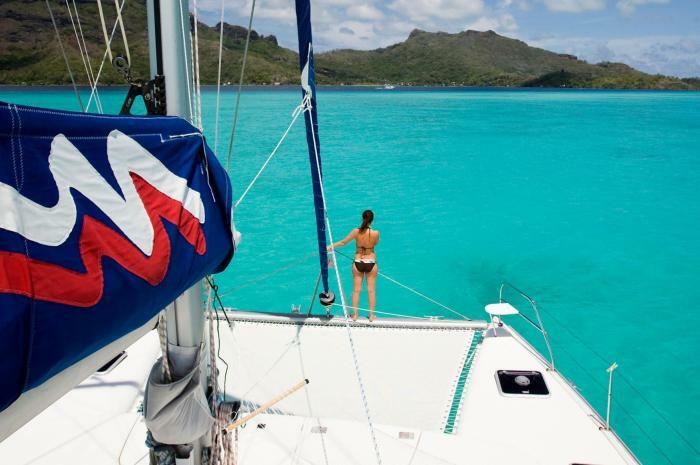 Join Nate and Heather Atwater, your Tahiti sailing cruise leaders, on this bucket list adventure! 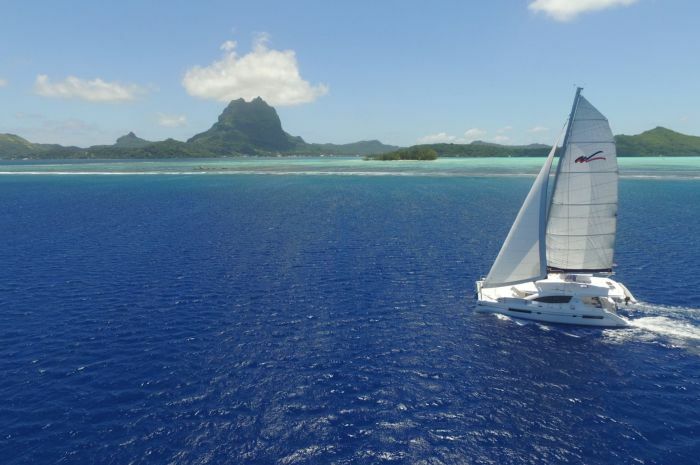 Spirited sailing on open-water passages take you to the fabled islands of Bora-Bora, Raiatea and Tahaa – each with its own panache and so much to explore and absorb. You anchor in beautiful calm waters behind coral reef atolls surrounding exotic islands.The islands are known for their beautiful white sand beaches and incredible snorkeling sites where you can see more than 500 species of fish, turtles, Delfine, porpoises and sharks. The boats are at The Moorings Base in Marina Apooiti, ready to board at 10 a.m. Heather and Nate Atwater – your Tahiti sailing cruise leaders – will be there to greet you and guide you to your assigned yacht. After the chart briefing and orientation at 9 vormittags, you will board the boats, stow gear and food, and sail to the south side of Tahaa. Your first night aboard is at anchor at one of the nice spots deep in Baie Apu. This gorgeous anchorage is surrounded by spectacular scenery with many attractions ashore. There’s great snorkeling on the reef. Spend time ashore exploring the many shops, art galleries, restaurants and chic hotels. The decision whether to anchor near the tiny island of Topua (the only remaining vestige of the massive volcano that formed Bora-Bora), or pick up moorings which are available for those dining at the Bloody Mary restaurant in Povai Bay, will be made in the morning by your Tahiti sailing cruise leaders before you set sail. A single barrier reef encircles the two islands that make up Bora-Bora. Mt. Otemanu’s black basalt rock face rises 2,362 feet above the sea, with impressive Mt. Pahia nearby. Both provide breathtaking views from lagoon anchorages where you will enjoy wonderful snorkeling and swimming. Visit the fabled Bora-Bora Yacht Club, north of the main island town of Vaitape Village. World famous among long-distance cruisers, enjoy a cool drink listening to their stories at the Club’s restaurant and bar. In the Village, are restaurants and shops where you should be able to find locally hand-made Batik pareos (which seasoned sailors and islanders wear as skirts and cover ups). Moorings here are free of charge if your boat decides to dine at the yacht club. 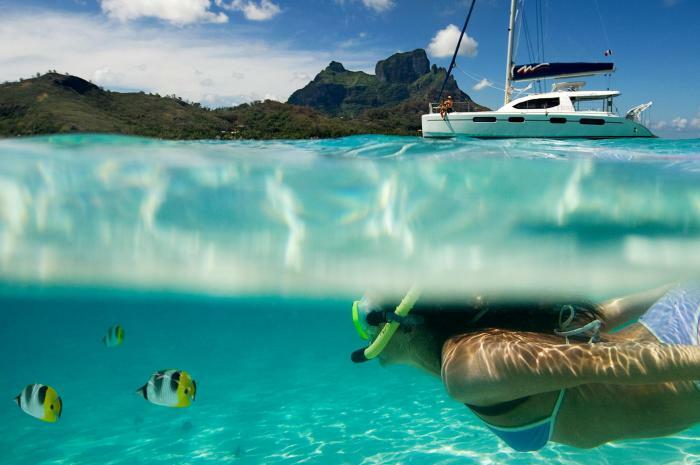 Sandy islands (motus) dot the barrier reef of Bora-Bora, at the far edge of the lagoon with impressive snorkeling. Along the reef on the southeast side of the island is Motu Piti Aau and Taurere, a beautiful place to anchor for the night, where you can watch the sun fade behind lush green mountains. This area of Tahiti is pure delight, where at the end of nice day of sailing you can sit on deck with your crewmates, enjoying cocktails and dinner under a velvet sky. Tahaa is known for its many vanilla plantations in valleys surrounded by beautiful mountains. It’s well worth it to hire a native to take you on a plantation tour. You will likely pick up moorings at Hibiscus Restaurant in Haamene Bay, the largest protected body of water on the island. Take some time to hike the trail through the dense tropical forest over Mt. Taira to the head of Hurepiti Bay. Or just lie back and smell the fragrant scent of vanilla that fills the air. Black pearls, grown on aquatic farms (some open to the public) are crafted by local artisans into beautiful bracelets, necklaces and rings for sale in shops all over the islands. 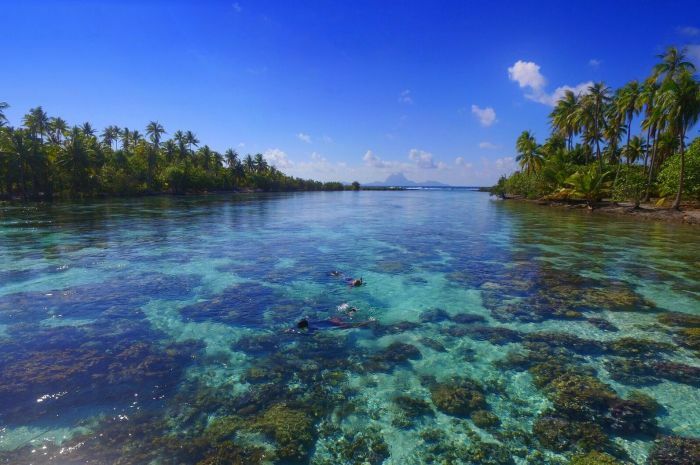 Tahaa has a sea turtle preserve, and many fjord-like inlets, with superb reef snorkeling and white-sand beaches. Today you cruise over the north end of Raiatea, then southeast along the eastern coast to the well-marked channel that takes you into the bay. Steep mountains with tall palms and lush vegetation rise on both sides. You must take the time here to explore the Aopomau River by dinghy, an amazing trip through a jungle peppered with working plantations. Mountains are constantly visible with Mt. Tefaatuait, the tallest peak at 3,400 feet rising above sea level. 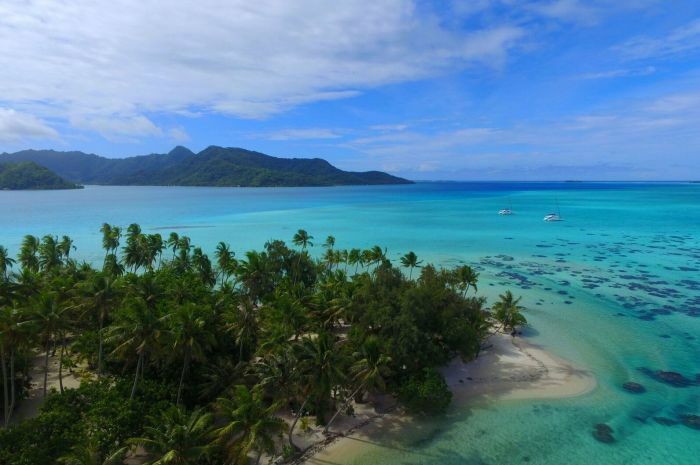 Known as the Sacred Island, Raiatea is the largest of the Tahitian Leeward islands and the cultural heart of Tahiti. 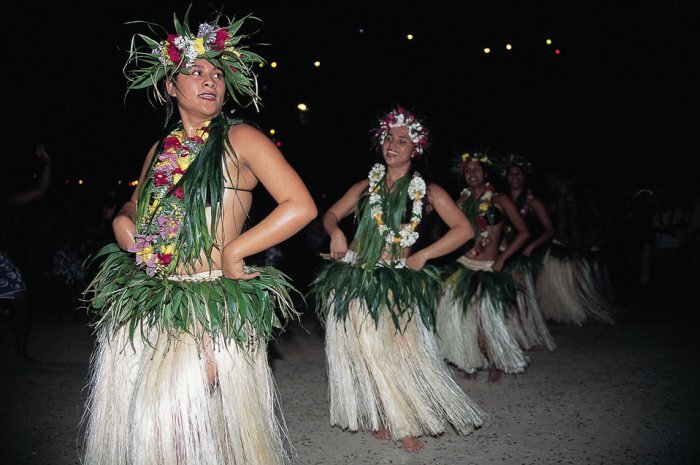 Formerly an important port on ancient Polynesian routes, traders traveled to and from Hawaii, Samoa, New Zealand and present-day French Polynesia. An island tour reveals many interesting archaeological and historic sites that offer a glimpse into Polynesian culture. As you anchor off the village, keep an eye out for pearl farm buoys before you drop the hook. Ashore is Taputapuatea Marae, an archaeological site restored in 1995 and under consideration as a World Heritage Site. It’s worth a hike to see the great stone altar and stone figures called Tikis, all dating before 1000 A.D. The lagoon was once a staging area for long-distance Polynesian voyages that led to the settlement of New Zealand and the Maori people. There is a small village on shore and vanilla plantations inland. Fly to the Capital of Tahiti, Papeete, and then catch a direct flight to Tahiti/Faa’a airport on Raiatea. 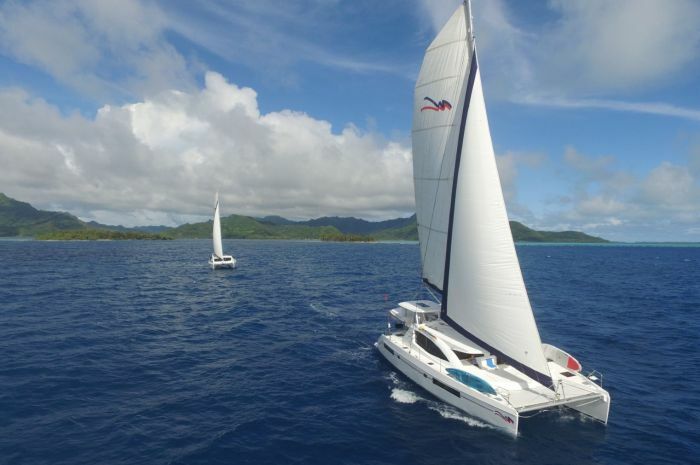 The Moorings base is at Marina Apooiti, 5 minutes from the Raiatea airport. Taxi fare is around $15. The Tahiti vacation package’s Meet and Greet Welcome Party, hosted by Nate and Heather, bevor die Boote am Freitagabend wahrscheinlich stattfinden wird Einsteigen,en. We highly recommend contacting Soun Saysomvang who books trips for Moorings customers: Soun.Saysomvang@thimarine.com). 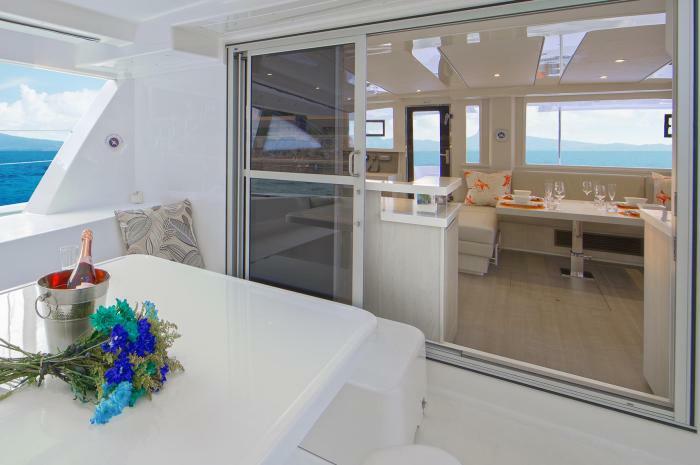 With four spacious double-bed guest staterooms and private en-suite baths, this is a superbly comfortable catamaran to cruise and relax on. 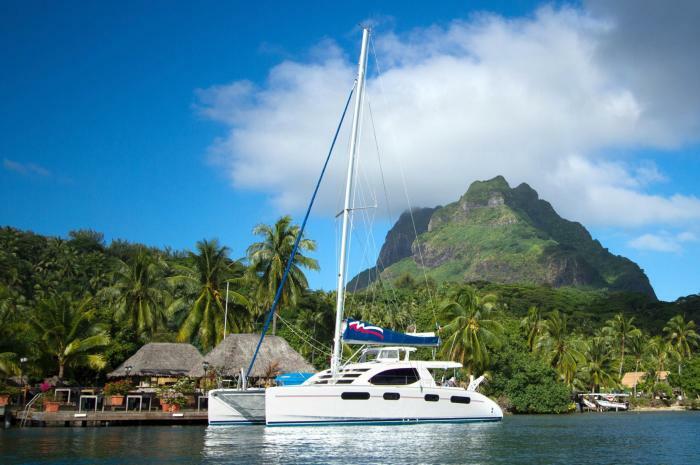 Your Tahiti vacation package is on four of these impressive yachts with just 15 cabins available. Warten Sie nicht Ihren Platz zu gehen Bareboat-Segeln in Tahiti reservieren. 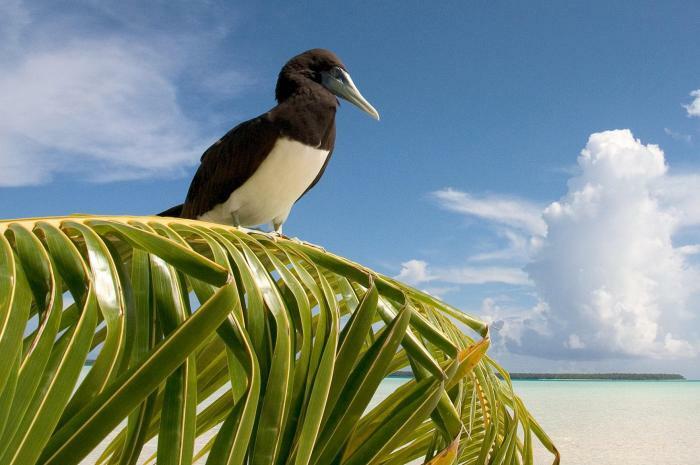 Anruf 888-454-7015 and get ready to hop aboard and see the beautiful islands under sail. 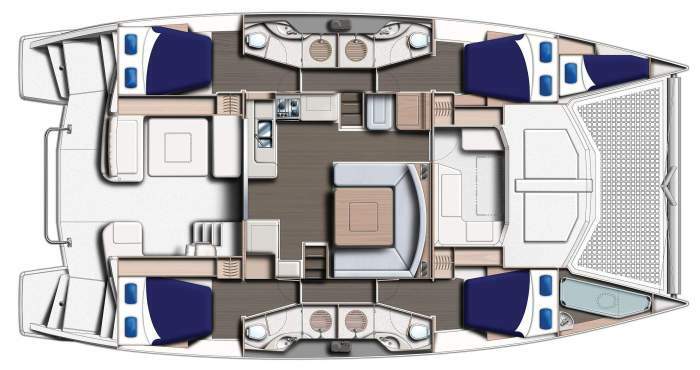 Die 4800 has a large covered aft cockpit with wrap-around seating, a large forward cockpit accessible from the salon, a bright interior featuring a fully-appointed galley, spacious U-shaped settee, Flachbildfernseher, klimaanlage, and panoramic view of the outdoors. There’s a shower on the stern to rinse off after swimming and lots of deck space for sunning. To reserve your cabin, ein 30% deposit is required when you sign up. The balance plus a $300 refundable security deposit per person is due July 27, 2018. If you cancel prior to July 27, 2018 all monies paid less a $300 per person cancellation fee will be refunded. After that date no refunds for cancellations are allowed. Please buy trip insurance – click here to find out more. There are several options if you have a smart phone: (1) Check with your provider to get an extension for French Polynesia; (2) use Skype to call internationally; (3) buy a SIM card that works off the VINI network, which can be purchased in Papeete or at the post office in Urutoa on Raitaea. 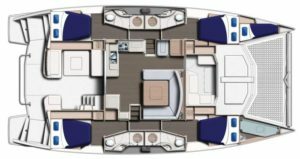 The Moorings will provide one mobile phone for each yacht, kostenlos, but you will have to buy pre-paid calling cards ($1.50/minute). Incoming calls are at no cost on the boat cell phones. There are just 15 cabins available for this Tahiti sailing cruise and they will go mighty fast! Don’t miss out on this French Polynesian adventure, a lifetime goal on your bucket list, right? Take a look at this video now.